Would you be surprised to know that I actually put together a list of books I want to read this year? I know it's a shocker when you consider that's what this little corner of the internet is devoted to: My personal reading list! To be honest, since I graduated college (years ago now) I have avoided making an actual list of books to read each year. I keep a list of books I'm interested in, and of course I have large stacks of books to read on my shelves - let's not even mention my Kindle. I guess after years of having lists of books put together by teachers, the idea of another book list just didn't thrill me. But this year is a little different. I wanted to put together a list. Of course, I might not actually read all the books on this list. And I'm sure I will add others to it during the year. But for now, this is what I'm hoping to get my hands on. Escape from Reason by Francis Schaeffer - I've heard good things about this book, but haven't taken the time to really sit down and read it... maybe 2014 is the year! Living Beyond Yourself: Exploring the Fruit of the Spirit by Beth Moore - again, I've already started this study in a large bible study class, what can I say, it's a Beth Moore study? I'll make sure to put my review up here when I'm done. Mere Christianity by C.S. Lewis - after re-reading The Screwtape Letters (more to come on that later) I've decided to re-read some others by Lewis, so why not start with Mere Christianity? The Unburdened Heart by Suzanne Eller - This is one that I missed somehow last year completely and have only heard good reviews on, so of course I'm thinking it should be on my list! Carry On Warrior by Glennon Melton - My mom and I have enjoyed many of Melton's blog posts over the past few years, so when her book came out it was the perfect gift to give to my mom... now I'm just waiting for my turn to read it. Quiet: The Power of Introverts in a World that Can't Stop Talking by Susan Cain - You might be surprised to know that I am certainly an introvert, granted, I can hide this side of myself in public often so of course I want to get this book on my reading list! 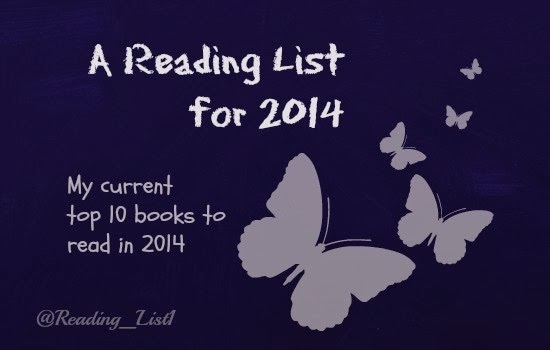 Now that you know my current reading list, what is on your 2014 reading list? Or even what is sitting on your bedside table waiting for a few minutes of quiet reading? I'd love to hear from you! Do you have a suggestion? I'll take it! I also am trying to keep up with my GoodReads reading challenge again this year - I reached my goal for 2013 so here's to two year in a row! Here's to finding time to read in 2014!